Senate Bill 1624 will require the Attorney General to publish breach notices, ensuring the information is easily and promptly accessible to residents who may need to take steps to protect themselves. 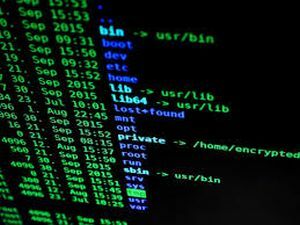 Under current law, if there is a data breach that compromises Illinois residents’ personal information, the company is required to notify the residents, but there is not yet a mechanism in place to ensure compliance. Senate Bill 1624 passed the Senate with bipartisan support and moves to the House for consideration. SPRINGFIELD – Native Americans in Illinois will soon have a stronger voice in state government under a measure sponsored by State Senator Suzy Glowiak. Glowiak (D-Western Springs) passed Senate Bill 727, which creates the Native American Advisory Council to increase the number of Native American state employees, on Thursday. Senate Bill 727 is an initiative of The Native American Chamber of Commerce of Illinois. 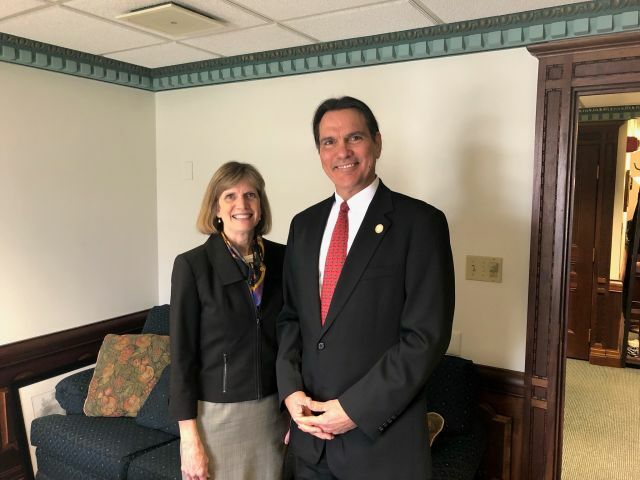 SPRINGFIELD – To advocate for Illinois Alzheimer’s patients, State Senator Suzy Glowiak (D-Western Springs) passed a measure to create a specialized position within the Illinois Department of Public Health to oversee the state’s Alzheimer’s efforts. 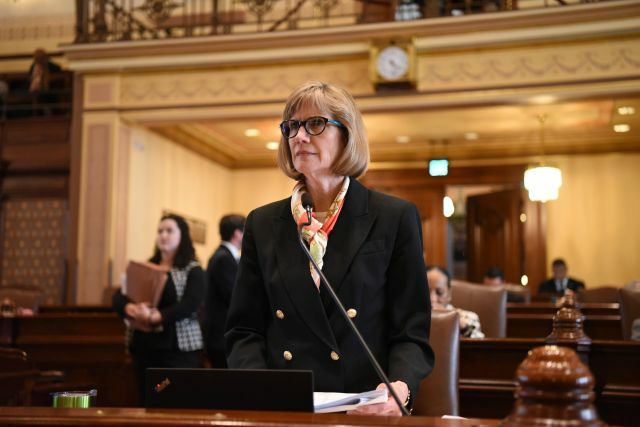 Glowiak’s Senate Bill 1726 creates the position of Dementia Coordinator in the Department of Public Health to oversee the implementation of the Illinois Alzheimer's Disease State Plan. Having a dedicated coordinator would help to address the complications and cost of a disease that has only gotten deadlier. The Alzheimer’s Disease Illinois State Plan was established in January 2014 and is required to be updated every three years. Nationally, the cost of caring for those with Alzheimer’s and other forms of dementia was estimated at nearly $236 billion in 2016, and is expected to increase to $1.1 trillion in 2019 dollars by mid-century. Medicare and Medicaid cover about 68 percent of the total health care and long-term payments. In 2016, the Medicaid cost of caring for people with Alzheimer’s in Illinois was $1.5 billion. Currently, the state plan cannot be implemented by IDPH due to lack of staff and other resources. An equivalent position exists in state government in Georgia, Hawaii, Mississippi, New Mexico, North Carolina, Texas, Utah, Virginia, Washington and Puerto Rico. Senate Bill 1726 passed the Senate with bipartisan support and now moves to the House for consideration. WESTERN SPRINGS – Illinois will join other states in raising the smoking age to 21 after the governor signed legislation supported by State Senator Suzy Glowiak on Sunday. Glowiak (D-Western Springs) advocated for the passage of “Tobacco 21” (House Bill 345), which raises the legal smoking age from 18 to 21, prohibiting the purchase of alternative nicotine products, electronic cigarettes and tobacco products by individuals under the age of 21. Glowiak cited studies that found 90 percent of all adult smokers started when they were kids. According to the Department of Health and Human Services it is estimated that each day approximately 2,100 youth and young adults who are occasional smokers become daily smokers. This measure was supported by the DuPage County Health Department, American Lung Association in Illinois, American Cancer Society and American Heart Association along with many others. 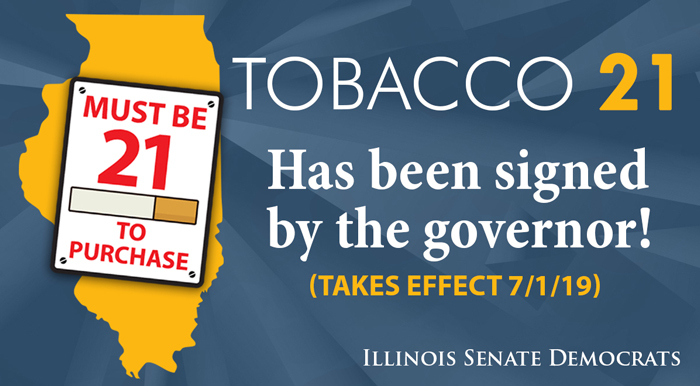 On Sunday, Illinois become the first Midwest state to adopt Tobacco 21, joining states such as California, New Jersey, Massachusetts, Oregon, Hawaii and Maine. The new law goes into effect July 1, 2019.